Welcome to our collection of English tools and resources for students, teachers, and educators. A conjunction joins words or groups of words. We can use the mnemonics FANBOYS to help us remember the coordinating conjunctions. 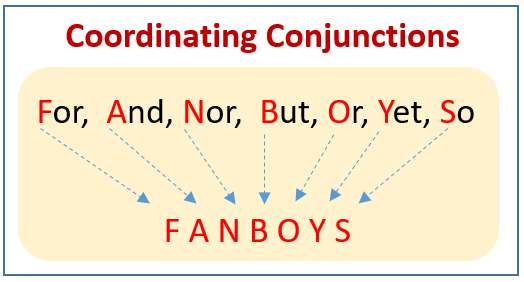 The following diagram gives the coordinating conjunctions: for, and, nor, but, or, yet, so (FANBOYS). Scroll down the page for more examples and solutions. Coordinating conjunctions may join single words, or they may join groups of words. They always connect items of the same kind and come between the words or clauses that they join. I prefer coffee, but my sister prefers tea. I don’t like running, nor do I like football. Correlative conjunctions also connect items of the same kind. However, unlike coordinating conjunctions, correlative conjunctions are always used in pairs. Both Paul and Sam played football in high school. Either you must clean the room or you will have to wash the dishes. A subordinate conjunction joins a subordinate clause to a main clause. A main clause or independent clause is a clause that can stand alone as a complete sentence. A subordinate clause or dependent clause does not express a complete idea. It must be attached to a main clause to complete its meaning. Since it was cold, I wore my coat. (I wore my coat is the main clause. Since it was cold is the subordinate clause).